If two or more Monsters move from the Swordsman ring to attack a Wall at the same time, the Wall is removed and 1 Monster (players' choice) takes 1 point of damage. The others are unharmed. All remaining Monsters stay in the Swordsman ring until the next Move Monsters phase. If no Wall is present between the Swordsman ring and the Castle ring, then Monsters pass into the Castle ring with no damage. 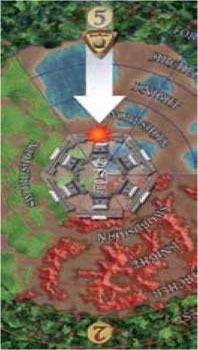 If a Monster moves into the same space in the Castle ring as a Tower, the Tower is removed and the Monster takes 1 point of damage. 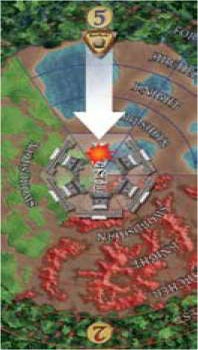 If the Monster survives, it stays in the space where the Tower was, as shown here. Monsters in the Castle ring are not affected by Walls. On the next Move Monsters phase, that Monster will move clockwise to the next Castle ring space. 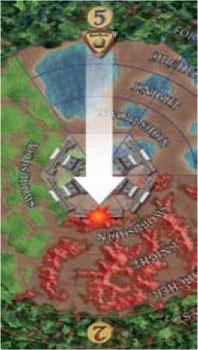 This movement will continue on each turn until that Monster loses its last point or the last Tower is destroyed. Towers that are destroyed can't be rebuilt. If all 6 are destroyed, the players lose the game-so make sure to defend the Towers! Once a Monster is in the Castle ring, it can only be affected by Castle cards that have the symbol on them. If two or more Monsters move at the same time into the same space as a Tower, the Tower is removed and 1 Monster (players' choice) takes 1 point of damage. The others are unharmed. All the Monsters stay in the space where the Tower was. In addition to the regular Monsters, there are many Special Monster tokens that have additional abilities. These Monsters attack the Castle as usual, but they also have a special effect that occurs when they are drawn. Boss Monsters can be identified by the gold background of their damage points. This royal Monster arrives with loyal subjects at his side. Roll the die, and place the Goblin King in the Forest. Then draw and resolve 3 more Monster tokens. This fierce warrior leads his troops into battle. Roll the die, and place the Orc Warlord in the Forest. 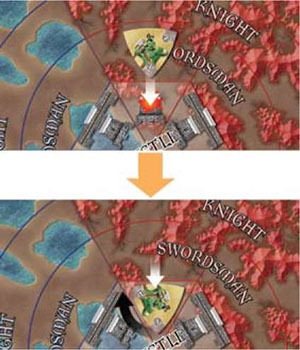 Then move all the Monsters, including the Orc Warlord, in the same color as the Orc Warlord 1 ring closer to the Castle or 1 space clockwise if they are in the Castle ring. This giant emboldens all Monsters to press the attack. Roll the die, and place the Troll Mage in the Forest. Then move all Monsters on the board, including the Troll Mage, 1 ring closer to the Castle or 1 space clockwise if they are in the Castle ring. His mysterious potion rejuvenates his allies. Roll the die, and place the Healer in the Forest. All Monsters on the board regain 1 point of damage. If a Monster is already at its full health, nothing happens. These tokens are not placed on the board but instead affect the players or the Monsters in different ways and are then placed in the Monster discard pile. These tokens have small symbols on them to help explain their effect. 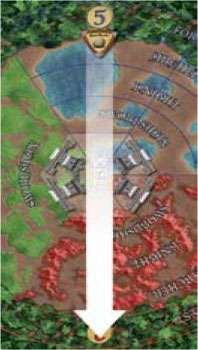 All Monsters in the Blue arc move 1 ring closer to the Castle. 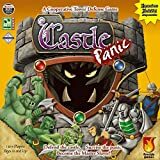 All Monsters in the Red arc move 1 ring closer to the Castle. 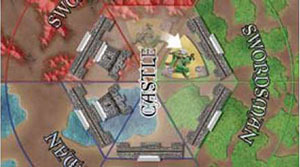 All Monsters in the Green arc move 1 ring closer to the Castle. Note: If the Monsters are in the Castle ring, they move 1 space clockwise. Remember, the Forest and Castle rings are included in the colored arcs. All Monsters move 1 space clockwise but stay in the same ring. This includes Monsters in the Castle and Forest rings. All Monsters move 1 space counter-clockwise but stay in the same ring. This includes Monsters in the Castle and Forest rings. Archers: All Players must discard all the Archer cards in their hands. Knights: All Players must discard all the Knight cards in their hands. Swordsmen: All Players must discard all the Swordsman cards in their hands. Each player must choose 1 card from his or her hand and discard it. If a player doesn't have any cards, that player takes no action. Draw and resolve 3 additional Monster tokens. Draw and resolve 4 additional Monster tokens. The Monsters have pushed a Giant Boulder from the forest, and it's rolling right toward the Castle! In their eagerness to attack, however, they may not have noticed that some of their friends might be in the way. Or maybe they just don't care. 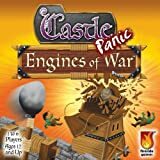 Giant Boulders immediately roll all the way across the board, destroying everything in their path until they hit and destroy a Wall, Tower, or Fortify token. Giant Boulders are the only way Monsters can be damaged while in the Forest ring. Roll the die to determine which arc the Boulder starts in. 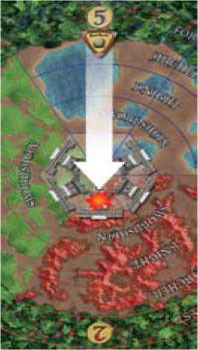 All Monsters in that numbered arc are destroyed, including any in the Forest ring. These Monsters are NOT kept as trophies; they are placed in the Monster discard pile. The Boulder stops rolling only when it hits and destroys a Wall, Tower, or Fortify token. This may mean the Boulder continues rolling through the Castle ring and into the opposite arc. If no Wall or Tower is present in that arc, the Boulder continues into the Forest, destroying any Monsters in its path. Here are a series of scenarios to show how a Giant Boulder behaves. Boulder destroys Wall in original arc and stops.